OMAHA, Neb. — An engineering professor says in a report released Monday that a Canadian company has underestimated the potential for spills along the pipeline it wants to build to carry tar sands oil across the Plains to refineries near the Gulf of Mexico. The U.S. State Department is reviewing the $7 billion Keystone XL project, which would double the capacity of the existing Keystone pipeline that runs from North Dakota to Oklahoma and Illinois. The State Department has said it would decide the project's fate by the end of this year. University of Nebraska-Lincoln engineering professor John Stansbury said neither TransCanada nor the regulators evaluating the proposed Keystone XL pipeline have properly considered the risks. "They presented what I thought was an unrealistically optimistic picture of the impacts from the pipeline," said Stansbury, an environmental engineer who specializes in water engineering and has been a consultant teaching the U.S. Army Corps of Engineers how to do risk assessments. Stansbury said he decided independently to examine the Keystone XL pipeline to help decision-makers evaluate the project. His report is based on publicly available information TransCanada and federal regulators have disclosed about the project and past pipeline spills, and some of his colleagues reviewed the report. He enlisted help from the environmental group Friends of the Earth, which has been critical of the project, to distribute the report. TransCanada has promised that the pipeline would be safe and reliable, and notes that it is subject to "comprehensive" safety regulation. Spokesman Terry Cunha said Monday that the company is still reviewing Stansbury's report, but that several of his conclusions are flawed. "We would not put our reputation or the public at risk by doing the things that this document, released by the Friends of the Earth, suggests," Cunha said. 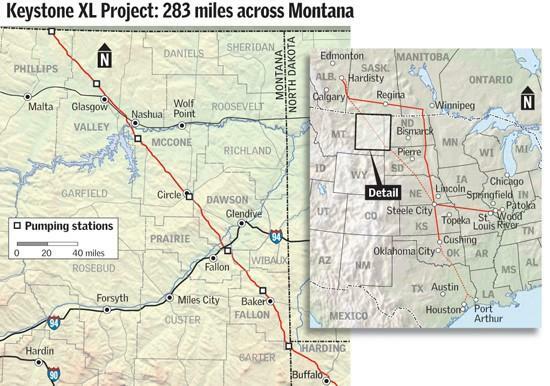 TransCanada's proposed Keystone XL project is designed to carry oil from Canada across Montana, South Dakota, Nebraska, Kansas, Oklahoma and Texas. TransCanada also has proposed connecting it to the Bakken oil field in Montana and North Dakota. The pipeline's proposed route crosses the massive underground Ogallala Aquifer, which supplies water for irrigation and drinking to people in eight U.S. states. Stansbury said TransCanada underestimated both the frequency of spills on the pipeline and the severity of the worst-case scenario spills. In examining several worst-case scenarios, he came up with much larger spill estimates than TransCanada. He also predicted there would be 91 significant spills of at least 50 barrels of oil over 50 years, not the 11 spills TransCanada predicts. TransCanada says its estimate comes from analyzing relevant threats to the pipeline and their likelihood of happening. "We use risk-based assessments that are industry-leading methods to quantify failure frequency," Cunha said. Stansbury said the failure of a pipeline valve near where the Keystone XL crosses a river could lead to a major spill. He estimated that such a scenario could lead to the release of more than 160,000 barrels of oil next to the Yellowstone River or more than 140,000 barrels near the Platte River. He said that massive spills such as that are extremely unlikely, but companies need to plan for them. Cunha said the construction methods TransCanada plans to use at river crossings, such as using heavy-walled pipe, make those locations some of the least likely to fail. He said TransCanada has a record of operating pipelines safely for more than 60 years. Environmental groups, including Friends of the Earth, have raised concerns that the pipeline could foul underground and surface water supplies, increase air pollution around refineries and harm wildlife. They also have speculated about what they consider inadequate pipeline safety and emergency spill responses. Last month, the Environmental Protection Agency said it believes the State Department has not done sufficient analysis of the project's impact on the environment and whether alternative routes should be considered. The EPA said it remains concerned about the risk of oil spills that could affect drinking water and sensitive ecosystems, as well as the project's effect on greenhouse gas emissions.